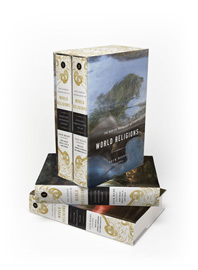 This magisterial Norton Anthology, edited by world-renowned scholars under the direction of Pulitzer Prize winner Jack Miles, offers a portable library of more than 1,000 primary texts from the world’s major religions: Hinduism, Buddhism, and Daoism (Volume 1); Judaism, Christianity, and Islam (Volume 2). The anthology brings together foundational works—the Bhagavad Gita, the Daodejing, the Bible, the Qur'an—with the writings of scholars, seekers, believers, and skeptics whose voices over centuries have kept these religions vital. To help readers encounter strikingly unfamiliar texts with pleasure, this Norton Anthology provides accessible introductions, headnotes, annotations, pronouncing glossaries, maps, illustrations, and chronologies. It also includes a dazzling general introduction by Jack Miles that questions whether religion can be defined and illuminates how world religions came to be acknowledged and studied, absorbed and altered, understood and misunderstood. For readers of any religion or none, The Norton Anthology of World Religions opens new worlds that, as Miles writes, invite us all "to see others with a measure of openness, empathy, and good will…In that capacity lies the foundation of human sympathy and cultural wisdom."